Refine and get comfortable 3D modeling different items and try bringing it to life, 3D print a small version of it! I’m primarily a digitally based artist, specifically though I’m a coder through and through, I will almost always opt to use code and logic to try and create my work. Conversely, in real life, I quite enjoy arts and crafts and using my hands. In particular, I enjoy making jewelry and metalsmithing, rings are some of my favorite things to create as they’re small, easy, cheap and a nice gift or token for friends and loved ones. Even “ugly” or “simplistic” rings are really nice and meaningful when they find out you hand made it for them. I figured, well why don’t I try to 3D model some basic rings and 3D print them! 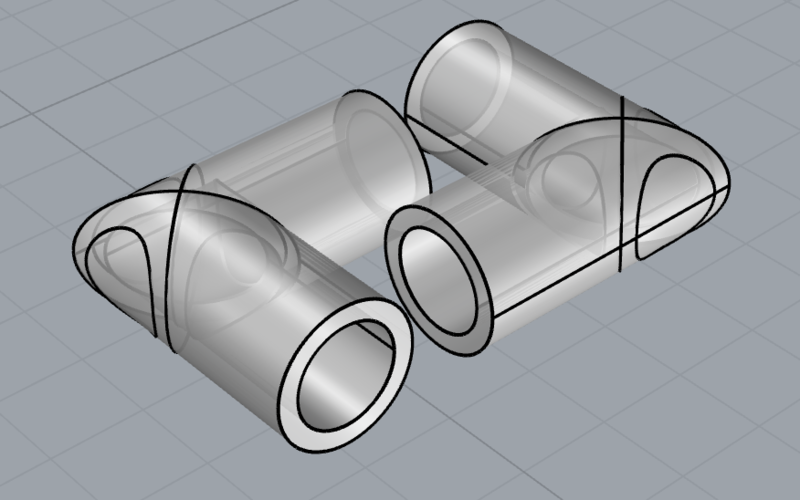 I’m not the most creative person in the world, to be honest, and I definitely am not the most confident about my skills when it comes to 3D modeling so I followed several rhino3D modeling tutorials online to create a simple ring design utilizing subtracting and adding cylinder shapes to a basic cylindrical ring. The design of the ring is actually quite nice in my opinion, very simple and geometric but I think I may have butchered the settings for the 3D printer causing it to get very thin ad rugged around the edges. For my final project, I wanted to take inspiration from my life. I thought for a long time about what needs in my daily life weren’t being met, or what could be made easier in the ways I moved through the world. I thought about my traveling, my studies, and one of the most important things in the world to me, my family. When I finally thought about my family, it was an easy step to the heart and soul of my project. My grandmother — we call her Nonnie — was diagnosed with Alzheimer’s Disease (阿兹海默症) around 8 years ago. Since then, she has been living at my mother’s house. When I was still in high school, we all lived under the same roof, and my mother continues to take care of her at home to this day. Nonnie’s disease is a difficult reality of our life. She is a wonderful woman, and she handles it with grace. She stays chipper most days, and has an incredibly sharp sense of humor. However, as time progresses, her memory and ability to function on her own continues to go, and at this point she cannot be left alone for any period of time longer than a few minutes. It was with this in mind that I started to design. I wanted to make something simple and relatively easy to construct that would help my mother and Nonnie. I had no idea what form this was going to take, but I started to research. In looking at sites with goods specifically made for people suffering memory and cognitive losses, a few things became apparent. First and foremost, most of the products that already exist are extremely expensive, and are most likely not affordable for many people. Secondly, many of them were simple, or designed to look simple. Third, they attempted to engage a person’s motor skills and creativity. Another phase of my research was looking at art created by people with Alzheimer’s/Dementia. Not a ton of this made it into my product, but here’s a photo of a self portrait done by William Utermohlen in his last few years living with the disease for reference. From here, I moved on to design. I wanted to work with a few principles in mind. At this point, I was picturing some kind of case that you could put an alarm inside of. The intention would be that as the alarm goes off, the person using it has to work out how to open the case (it’d be quite simple), and once they opened it and turned off the alarm, there’d be simple reminders or rewards inside the case with the alarm. These simple drawings were my launching ground. With these ideas in mind, I reached out to my family to get their thoughts on the process. My mother gave me a harsh reality check (albeit in a gentle way). She told me that an alarm/schedule based object would probably be too complex for Nonnie at this point, and suggested instead I create a rewards based system that would engage my grandmother for a short amount of time, and would offer a reward. With this, my idea shifted, and it was back to the drawing board. Though rough, this shows where my thinking headed. 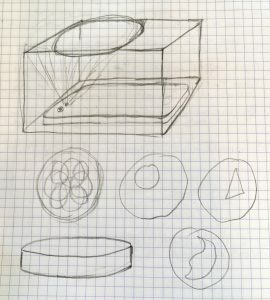 I was now looking to create a simple box, where the person using it could see whats inside. I wanted it to be simple, with a few extra steps that could be added to make it slightly more complex if the person found the original version too simple. The tabs crudely drawn would hold the box closed from all four sides, and the person using it would have to remove all four tabs to open the box. The person would be able to see into the box! At this point I hadn’t designed the top. A simple box, made with makercase.com. Added are the slots in the side where the person using the box could see into it, and four holes on the top that allow for some sort of peg mechanism to be used (which I hadn’t yet worked out). Upon construction, we had a box!!!! Next up was to design the tabs and pegs that would go into the slots on the box, holding it closed. MISTAKES. The left two both printed incorrectly. The one on the right (which i printed on its side) was better, but didn’t line up well with the peg holes I had made in the initial box. Back to rhino! This tabs printed like a beauty, and also fit well with the holes on the box! Last up was to design the tabs that would go in the holes on both box and the pegs. This was simple, just had to make sure I got my dimensions correct. What you are seeing in the photo is two pegs hot glued together (making them easier to grab), with tape on one end to make the fit a little tighter when inserted into the box. There is still much work to be done on this process. The box, though semi-functioning, is hardly a complete product. It is far too simple, the dimensions aren’t quite right, and the construction of certain elements — mainly the tabs and pegs — could benefit from being done in higher quality. However, I think that this project serves as a better prototype for my concept, than for a marketable product. My box is simple, easy to construct, and cheap to manufacture. It is easy to understand, and with small adjustments could be quite easy for someone with limited mobility to grab and take apart. The concepts behind it show through in the design, and I am happy that this model can serve as inspiration for further iterations of this product as I continue to develop it. 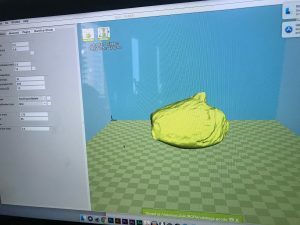 For 3D printing, I wanted to make something I would actually use in my day to day life. 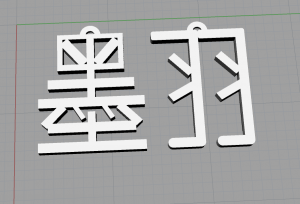 It took me a long time to think of an object I thought would be useful, but I eventually opted to try and make earrings out of the characters of my Chinese name. 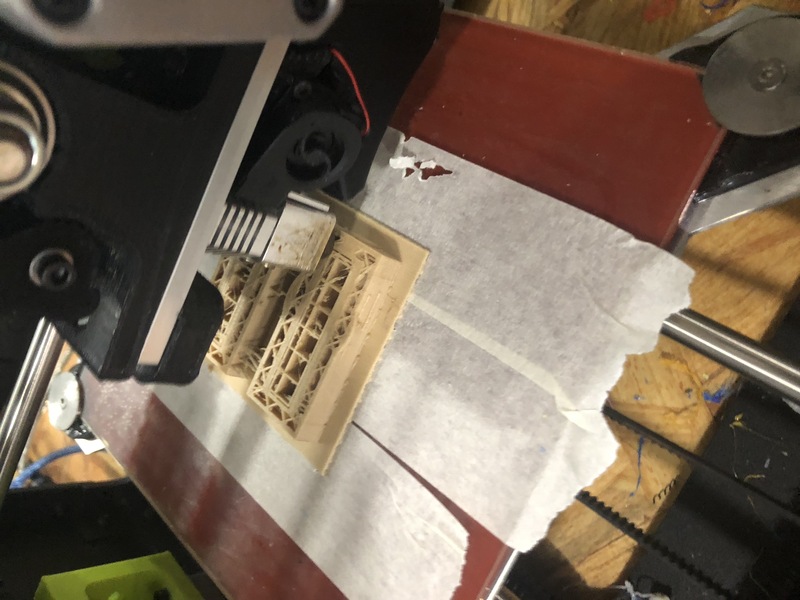 I chose 3D printing because I really like how the material looks when it has finished printing (though Marcela pointed out that laser cutting would be easier AND give me a cleaner finished product). The process itself was not very difficult. In mocking up the characters, I simply used Rhino and drew them to the best of my ability, mainly using curves and later extruding them. 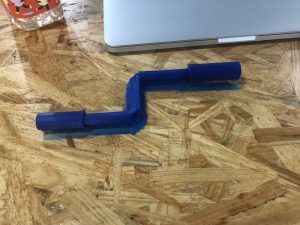 The tools that ended up being the most useful for this creation were ExtrudeCrv and the Mirror tool, as there are several parts of the piece I wanted to be lined up identically on either side. A lot of my trouble came in working with the printers themselves. 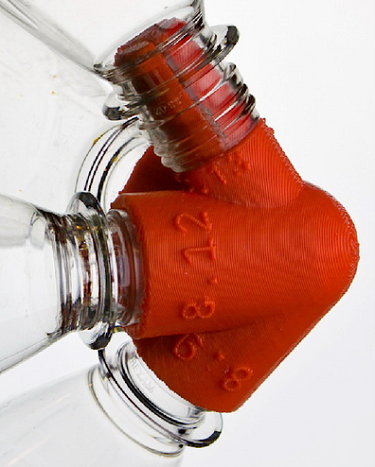 Several times, the raft wouldn’t print correctly, and I would have to stop the printing. It turns out that the board needed to be recalibrate — in lieu of doing that, I eventually moved the printing to happen on a different spot, and it took. My next problem came in the form of the finished product. With all three of the above models, I had different problems. For all three, the raft was far too thick and the print too small, so it was nigh impossible to get all of the raft off, and they all ended up looking sloppy. Also, for two of the prints, part of the model did not print fully or printed in a way that was structurally insecure. When I do this again, I’ll be sure to laser cut. Will be about 30x faster and cleaner. Now I know! Use Adobe Illustrator to design an .ai file can be laser cut or engraved etc, get practice with the different tools in the fabrication lab. When it comes to creating physical things I’m not very creative, I’m not actually very good with my hands in general actually, I prefer to do everything in the digital realm. I decided to try to make two different things with the laser cutter, two different engravings with different materials and with different purposes. This would be my first foray into using the laser cutter and I wasn’t particularly confident in my design skills so I decided to cheat a little bit, just a little bit, ok maybe a lot a bit and I transformed a photograph that I taken into a very simple illustration in Adobe Illustrator. I limited the colors and removed the details so that the laser cutter would have an easier time engraving. Below is the original image and after that is the rubber stamp that I engraved. 2: Acrylic: Business Card? Name Template? This was a more functional design for an acrylic name card as for the longest time I haven’t had any form of business card etc. I wanted try and use some of my new 3D Fabrication skills in order to create something I might be able to use in real life, or at least a prototype. I created the .ai file from combining different geometric shapes and my signature. Laser cutting this actually failed several times as I ran into many issues with the outline not being large enough and the printer not actually cutting through the acrylic all the way. I also struggled with making sure everything in the .ai file was actually black and not also partly grey as my original version included a sort of gradient. The objective of the final project was to design and fabricate an aesthetic object for our room or the studio while using at least two fabrication methods covered by the class. I have decided to make a bookend for my room. As a result of living in China for the past five years, I have read and collected a decent number of Chinese and Japanese literature. 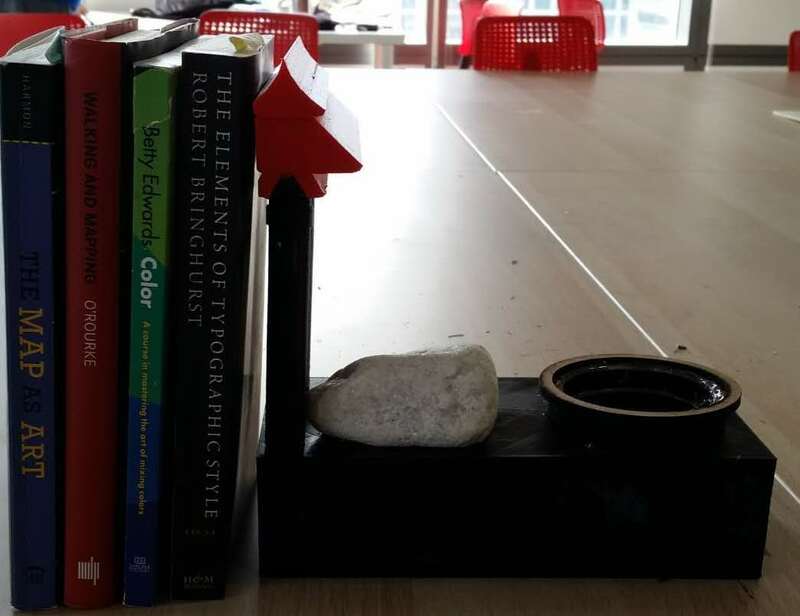 For this reason, I wanted to make a book holder which will reflect the regional and thematic characteristics of the literature it will be holding. For example, I already have a Herodotus statue replica holding by European History collection, and Plato’s holding all of my philosophy books. So i think this book holder will only contribute to an already established pattern. Two readings assigned for the class have greatly shaped my approach to this project. First being an article called: “ How to Make Almost Anything: The Digital Fabrication Revolution” , written by Neil Gershenfeld. He stated that “ the goal of personal fabrication is not to make what you can buy in the store, but to make what you can not buy”. What he meant by this is that digital fabrication allows for personalization. For this reason I attempted to design a bookend which I can not find on Taobao, Amazon or gift shops of Athena. This reading had also explored the idea of recycling and using analog versus “digital” materials. 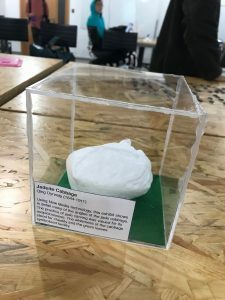 This got me thinking about materials which are used in digital fabrication, are they synthetic or natural, polished or “raw”. This process was further deepened by another article called “Hybrid Reassemblage: An Exploration of Craft, Digital Fabrication and Artifact Uniqueness” written by Amit Zoran and Leah Buechley. Bellow is a picture of a vase which was broken by accident, and given a new form resembling its original shape. 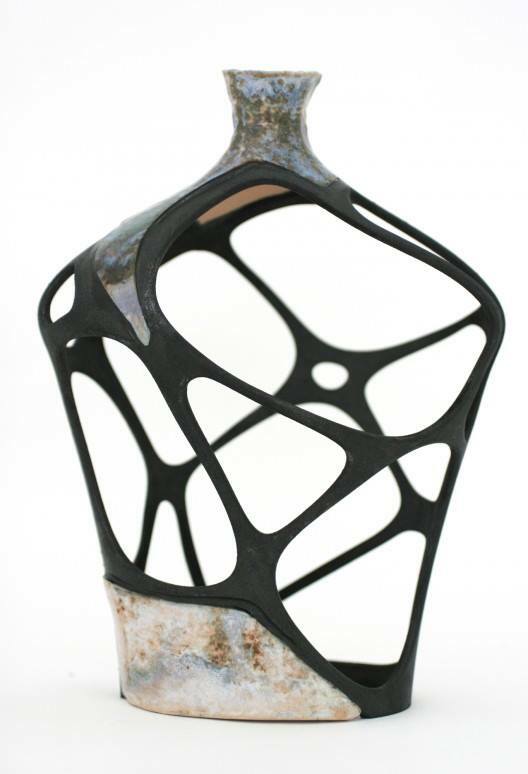 I was very interested in the way the ceramic piece and the 3D printed part are combined into a single composition. 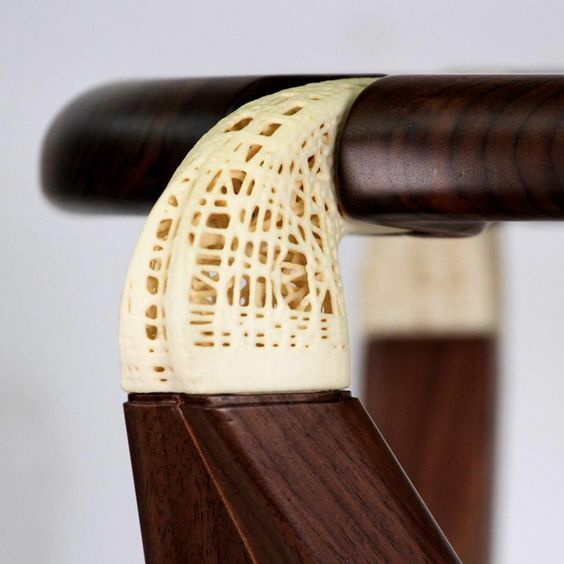 As I started researching Amit Zoran’s work, I ran across an artist called Shiran Magriso and her series of works called “Hybrid Joinery”. 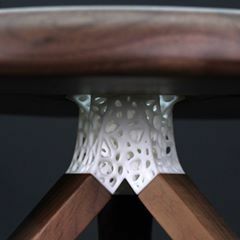 She creates furniture pieces made out of wood and used plastic 3D printed joints. Some of her pieces can be seen in the pictures attached below. 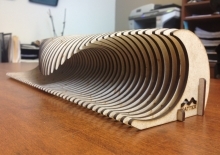 Knowing that my only way of including wood in my project would be to laser cut it and combine many layers into a 3D object or use a CNC machine, I started looking at some wood designs. 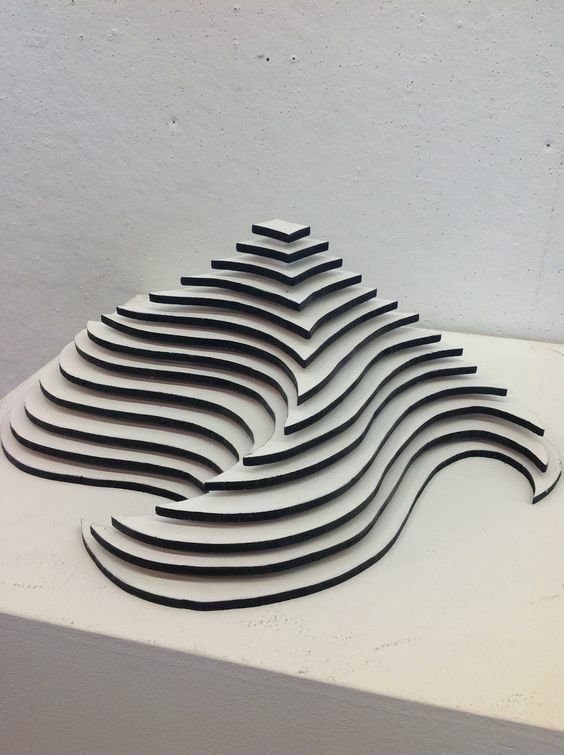 I ran across a website called “pinterest”, where I was inspired by two works published on the following link: https://www.pinterest.com/katyhillsco/digital-fabrication-art/ I have also made the pictures available below. At this point I had a general idea of what i wanted to do, and I started sketching out the book holder. As a result of my research, I decided to explore the way natural and synthetic materials can be used in composition of a single piece. I decided to laser cut wood, 3D print plastic and incorporate a rock in my design. 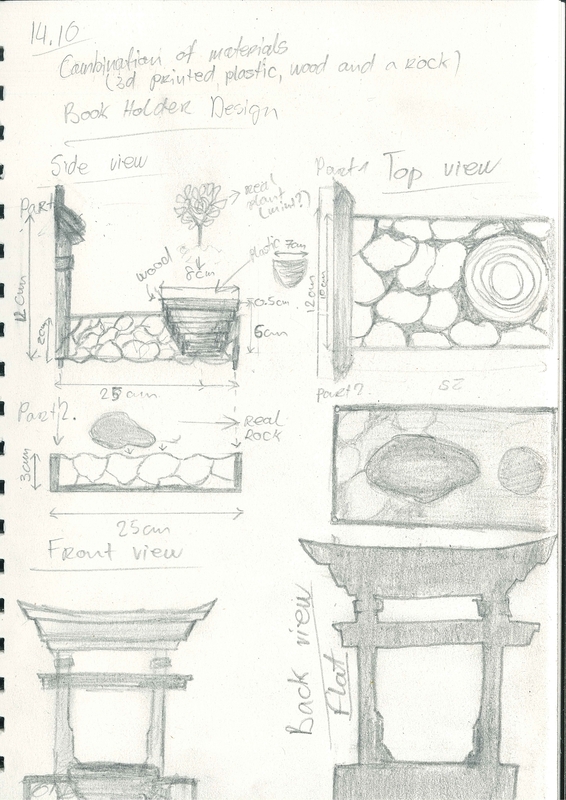 Below is scan of my original design including proportion as well as marking the materials. 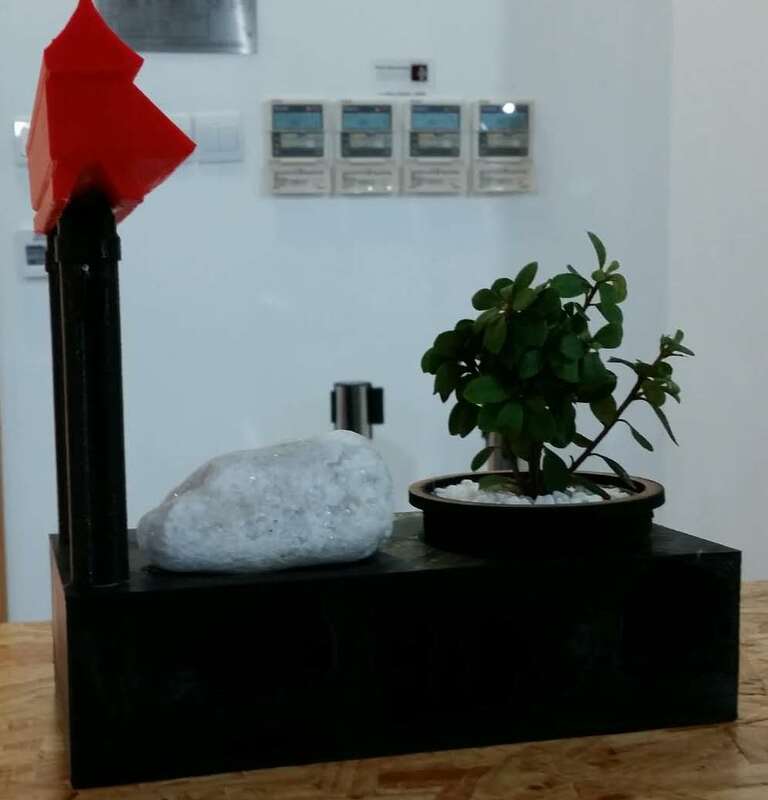 The wooden part is a flower pot in which i plan to grow Keshitsubo, which would be of a perfect size and contribute to the theme of the piece as well as the interaction between natural and unnatural objects. 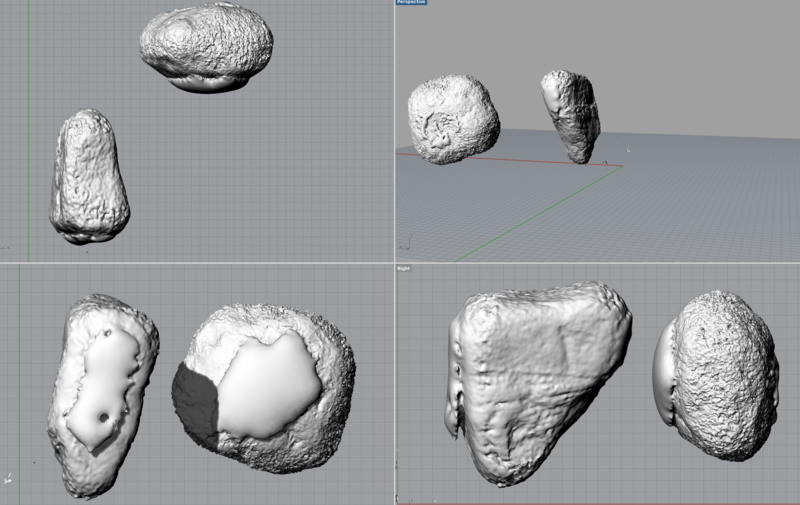 In order to have a better understanding of the base I decided to 3D scan 2 actual rocks. I would later also use these rocks to carve rock like space inside of the base, as well as create a bed on the base where the rock would rest. 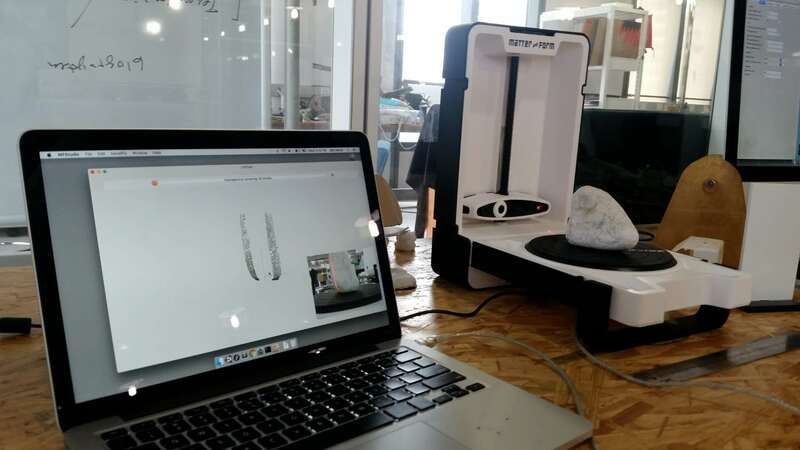 For 3D scanning, I used a Matter and Form 3D scanner. 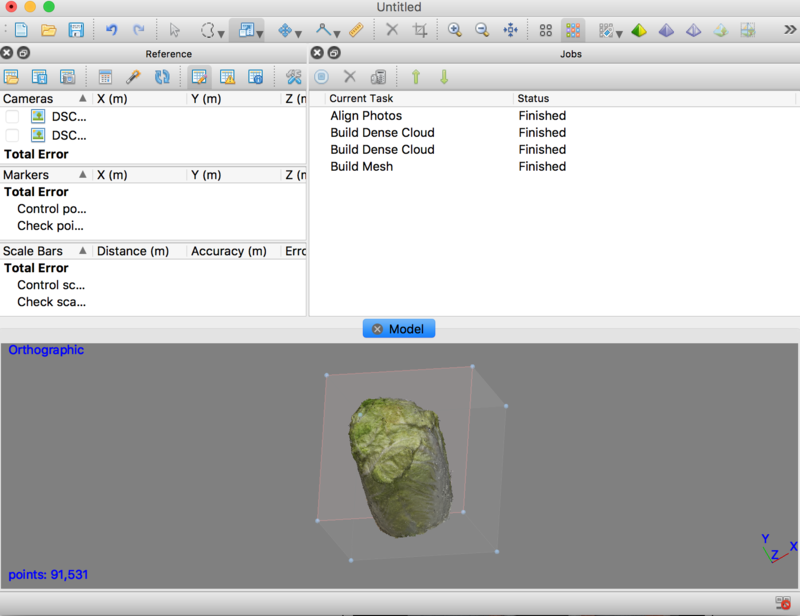 The software was very easy to use, and each rock took around an hour or so to scan. I was under an impression that our maximum printing capacity was 30x30x30. For this reason I set the base to be 25cm long, and later made it 26cm. 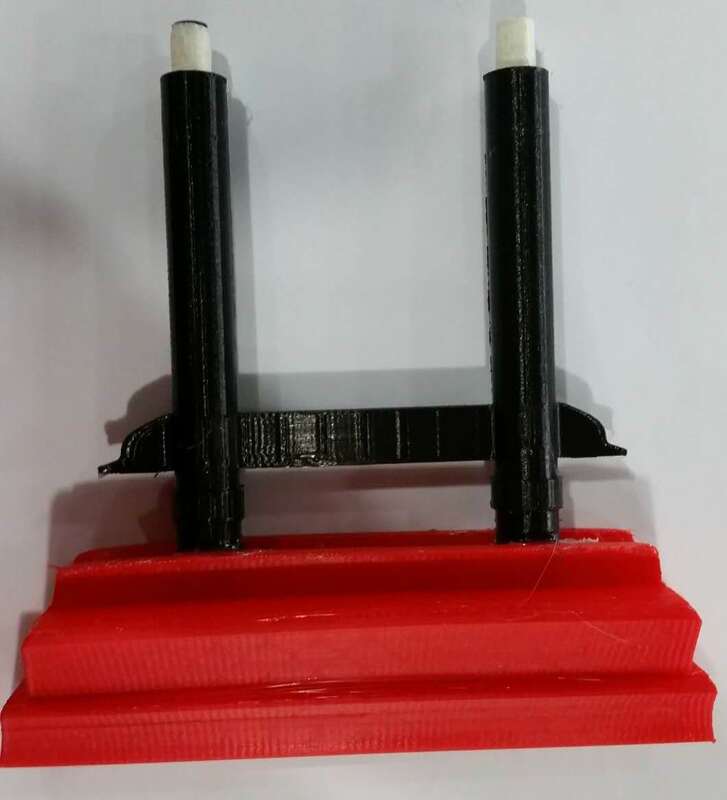 After, intending to print, I realized that I would need to redesign the base. The base could not be scaled because it involved 2 actual objects. a flower pot and an actual rock. However, after doing it one time, It was relatively easy to repeat the whole process once more. I would start off my creating a rectangle 11x20x6, then I would use a boolean difference function to carve rock like holes in the base. Then I created a flower pot, and carved a hole for it in the base. I made sure to note down the dimensions of each rind forming the flower pot, as these dimensions would later be used for laser cutting. 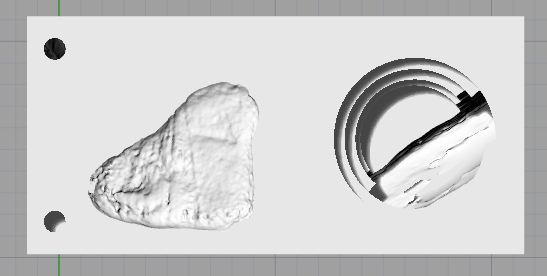 For each rock carved into the base I used one of the two 3D scanned rocks and changed its size, shape or angle. 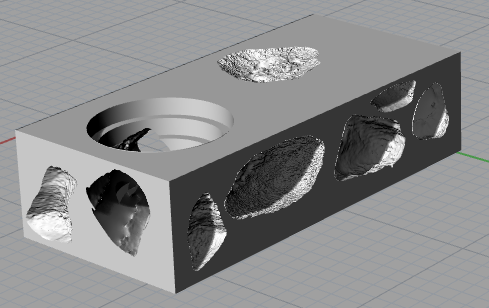 Since the more circular rock had a large area which was missing (could not be scanned), and I did not close the area well, if that area was touching the base it would cause an error when I would attempt to use boolean difference. For this reason, I mainly worked with one side of the rock and the other rock. I created 2 bases, identical in every way, except the bed for the rock to rest in. Below is the picture of the two designs. 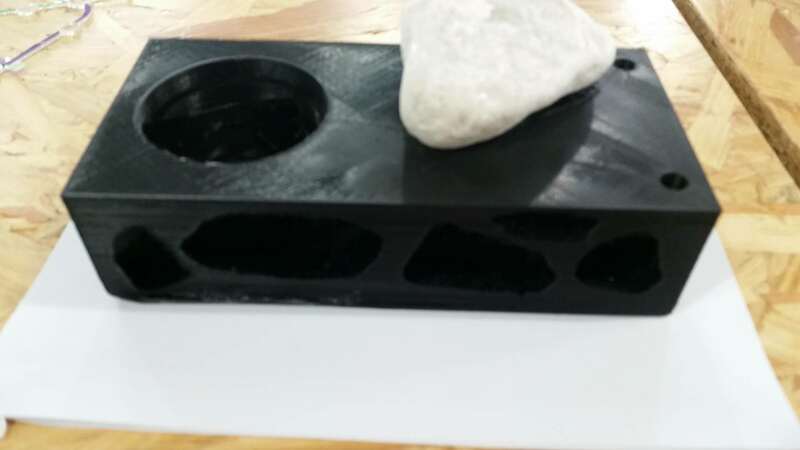 The two have the different base for the rock, and the second one also has holes where the gate will fit in. The holes were added in a later process with the help of professor Marcela. For the design, I used wire cut to shape the roof from a rectangle. As well as a board which is right under the roof. I would also wire cut the back so it is flat and it fits better against books. After working on it with professor Marcela, we decided to split the roof from the bottom part, making it easier to 3D Print. The two small cylinders seen in the first picture are meant to connect the gate and the base. 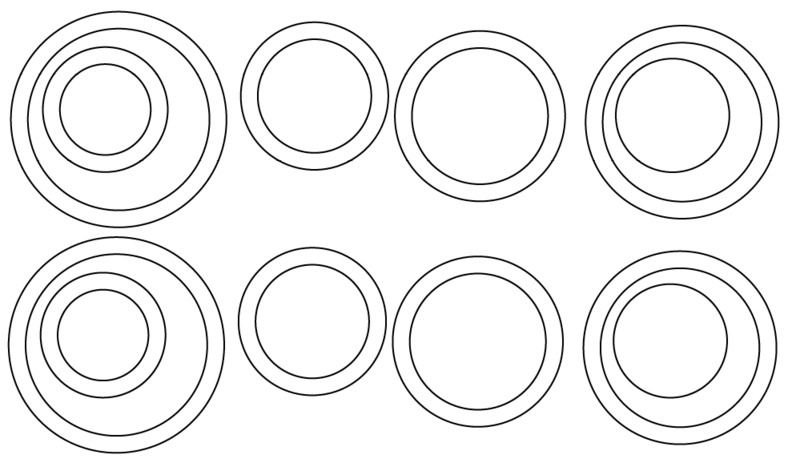 I used the dimension for the rings that I earlier noted down. Since each ring was to be laser cut, I used black 0.01 stroke. To conserve space I placed smaller rings in each of the larger rings. 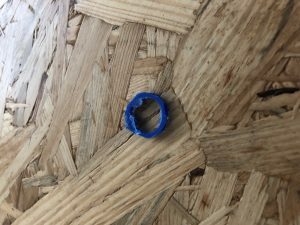 Because the maximum thickness of the wood material was 0.5 cm and I needed 1cm, I would cut two rings for each size. 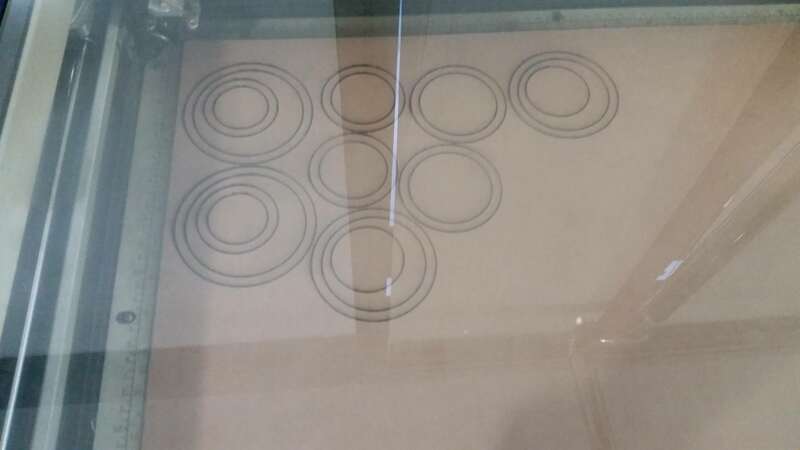 To make sure the pot fits into the 3D printed base, I decreased the diameter size of each ring by 1 mm. This is how my file looked like. For the final project and my prototype, I decided to print only one Bookend. This is because printing two would take a considerable amount of time and material. In total I printed four parts. 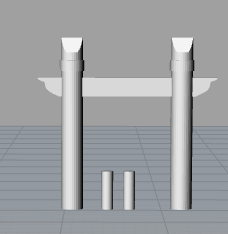 The base, the cylinders meant to connect the gate and the base, the gate roof, and the gate base. 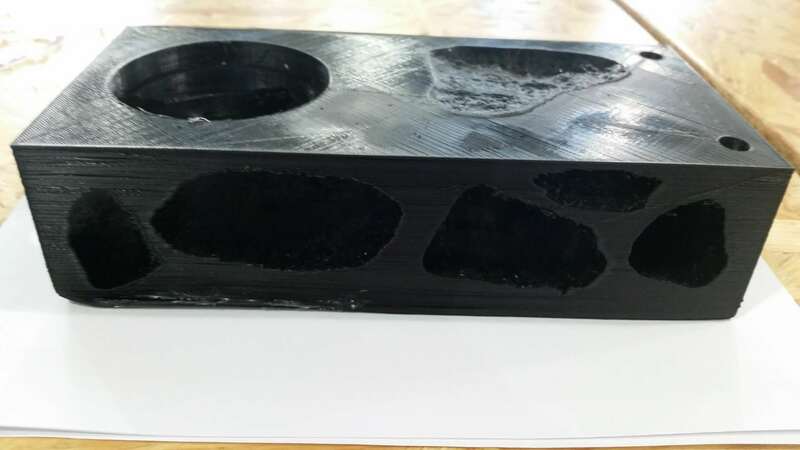 The base took longest to print (22h) and it came out a bit fragile, as outside layers did not stick well together. The rock would fit perfectly, and this is important going forward with this project. If I wanted to do 5% fill, it would take 29 hours. Given that I had 3 days to print, having the printer work for such long time increased a chance of failure. This is how the base came out. Cylinders connecting the base and the gate took only 5 minutes to print, however, the roof and the gate base took around 7 hours each to print. I decided to print the roof in red to distinguish it from the black base. After they were done, I glued the three together, and added some tape at the connecting part so it would fit better with the base. 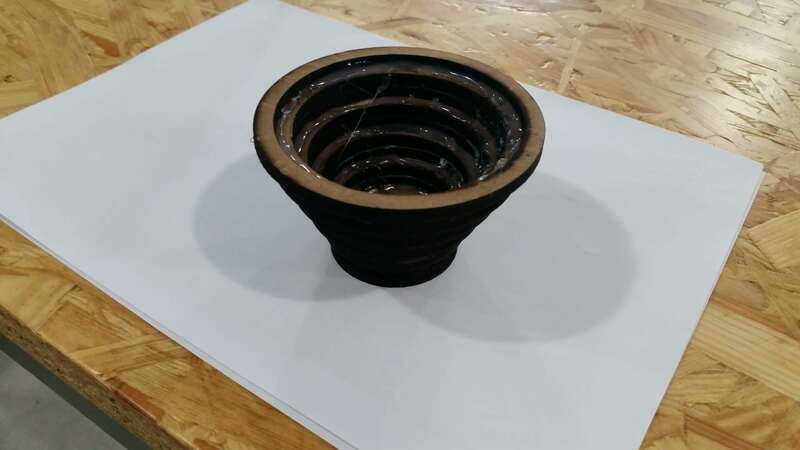 The last step was to laser cut the flower pot and assemble it. I first laser cut it out of cardboard and made sure it fits into the 3D model, then I laser cut it out of wood. I used a glue gun to connect each of the same size rings, and then connect those into a flower pot. I wish there was a better way to glue the parts together, I would definitely use wood adhesive or small nails next time. After all parts were printed and the flower pot was assembled, I assembled everything together and for presentation purposes placed a brunch inside of the flower pot. In the future I would like to grow Keshitsubo Bonsai inside of the pot. I learned a lot from the whole process. 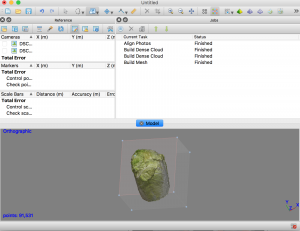 I became very comfortable with designing objects and navigating in Rhino. I also used almost every 3D printer in the lab, which made me familiar with how they work and how to prepare files for them. Overall, I am satisfied with the product. 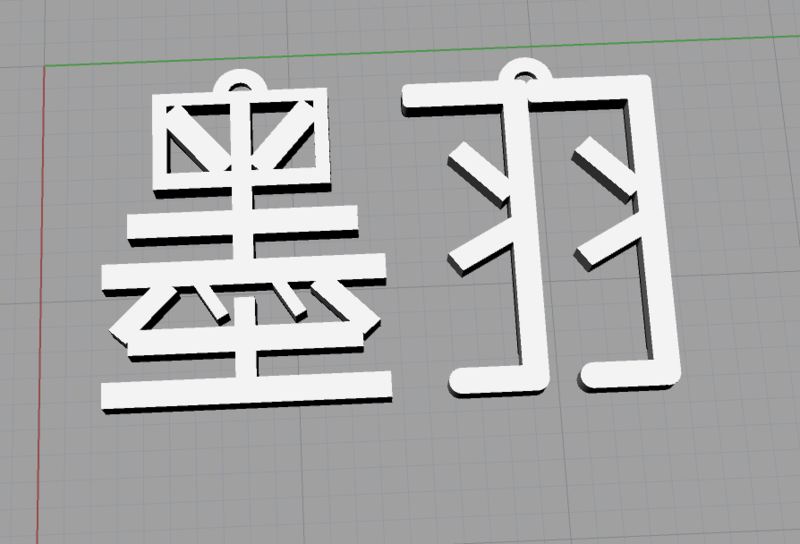 Going further, I would like to send both base designs to be printed in better quality on Taobao. I am satisfied with how the gate came out, so I will keep it. I will just print the second one in the lab. During the proposal presentation I got a feedback that it may be better to change the base to a thing that user can hold, and I think it really makes sense. 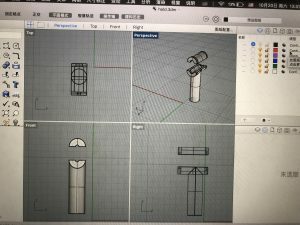 So I designed a hold for it and after I have the sketch, I started to build models in Rhino. The screwdriver should be divided into two parts, the spinning part and the hold. I made the hold top part hollow inside and also split it, so that I can put the spinning part inside. Then I saved them as .STL file and send them to 3d-printer. After they are printed I noticed a thing, that the round-corners were not printed successfully. In order not to print the whole thing again (which takes a long time), I designed such two things to hold the handles. I assembled all these things and used hot glue to strengthen the joints. I also take down the pointed part on a real screwdriver and glued it into the hole I made on the spinning part. But now it is hard to let this screwdriver stand on the table. 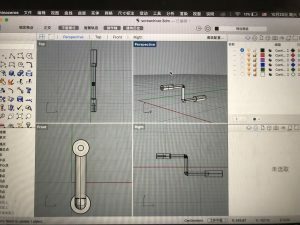 So finally I used the website “makercase”, and it gave me such a sketch according to the conditions I typed in. Then I added the circle on one of the sides to make a hole which can hold the screwdriver. 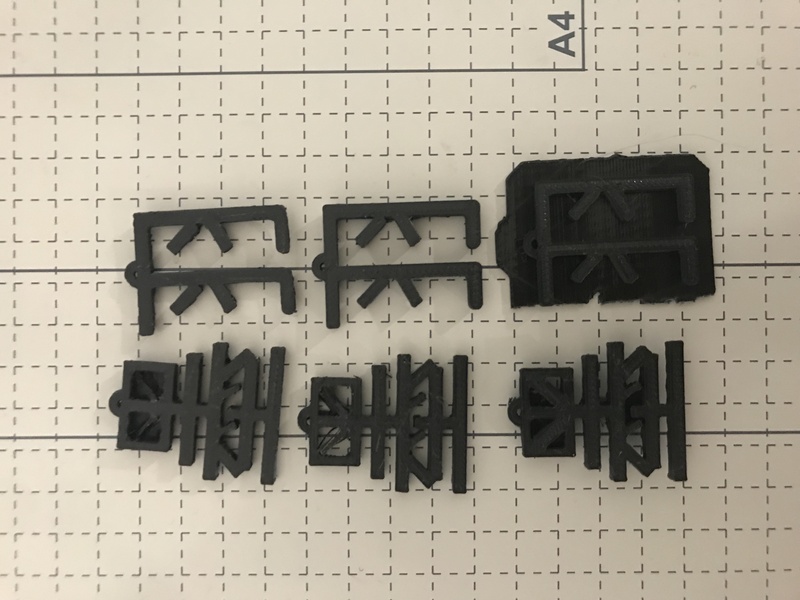 The quality of 3d printing is much lower than my expectation, so the things printed were not fit with each other. I had to try very hard to use emery paper to polish them. Next time I have to spend more time on modeling, because it is really important to take support into consideration. Some part I need it to be hollow, but at the same time hard to be printed without support. 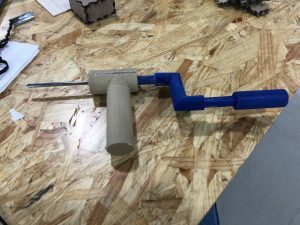 For this project I printed with support, and then I used tweezers, pliers, electric drill, etc, nearly everything to take off those supports. Really terrible. Visualone allows you to project visuals by just using your phone’s flashlight. Recently, in my Realtime Audiovisual Performing Systems course, we have seen many examples of artists working with light and projections of abstract shapes in order to make short films and animations. 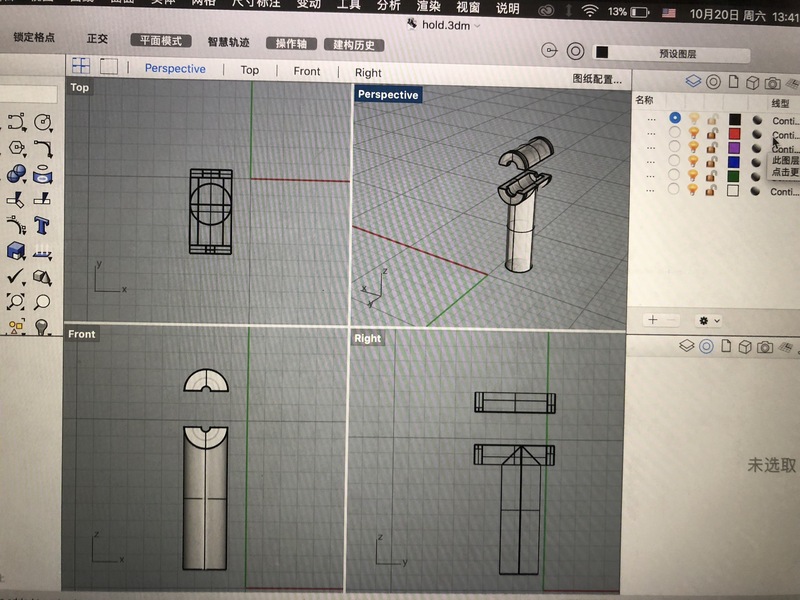 This is something which interests me very much, so my purpose for this assignment is to create my own little visual ‘machine’ by only using my phone’s flashlight and the materials that I will laser cut. The purpose of my project is pure entertainment and visual stimulation. Visualone does not necessarily resolve an everyday-life problem. However, I have been wanting to buy a projector for this specific use for quite a long time, and since I still have not bought one yet, I think this is a great opportunity to make something similar to a projector. Marry Ellen Bute is the main artists that inspired my for my project. Marry Ellen Bute’s main artworks are about visual music. She created an oscilloscope that could be played like an instrument and that is how she created her visual music. In my project, I will only concentrate on creating the visual aspect of it, as this is the aspect which interests me the most. My project will not be nearly as complicated as Bute’s oscilloscope, but I am very interested in using light and laser-cut templates to create my visual machine. Below, you can see one of Mary Ellen Bute’s artworks. 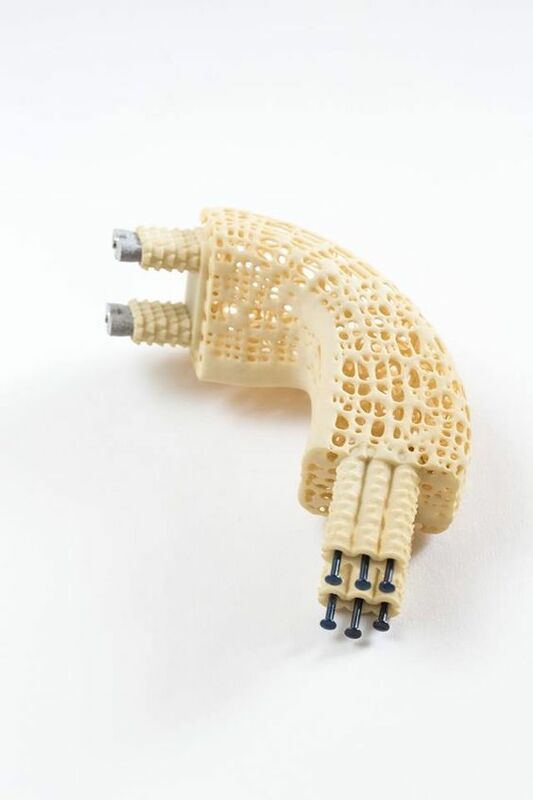 Another of the works that inspired me was this 3D printing system, where Trussfab creates joints which are then attached to plastic bottles in order to create large-scale structures. Although I will not be creating large structures, the reason why this was inspiring for me is because by creating very tiny connections, you can actually connected larger objects together. 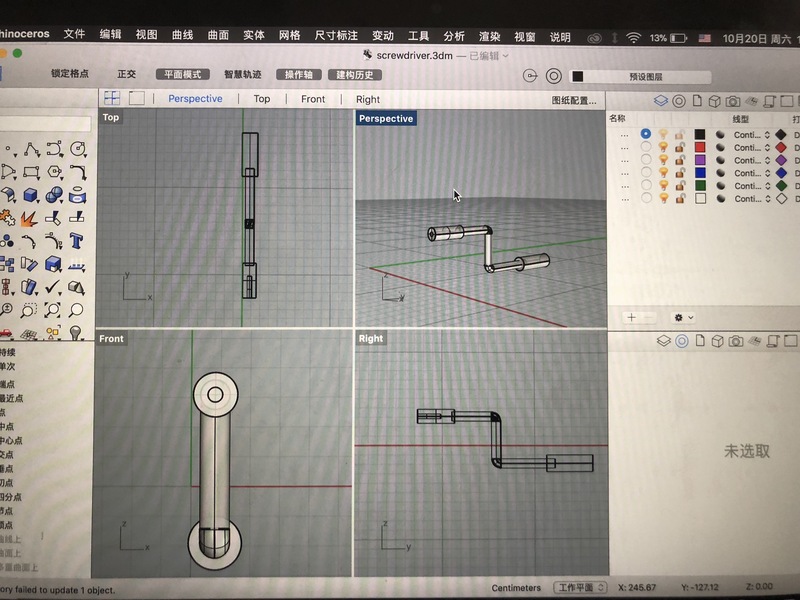 Thus, I want to create joints that are easy to attach to the templates, so that numerous templates can be placed on top of each other, while at the same time allowing them to rotate manually. My own iteration of this project will be an improvement mainly because I am making it so that I can use it with my iPhone’s flash light. Thus it’ll be relatively easy to use and to produce. Furthermore, if I get ‘bored’ of the templates I have, I can design new ones and use them. 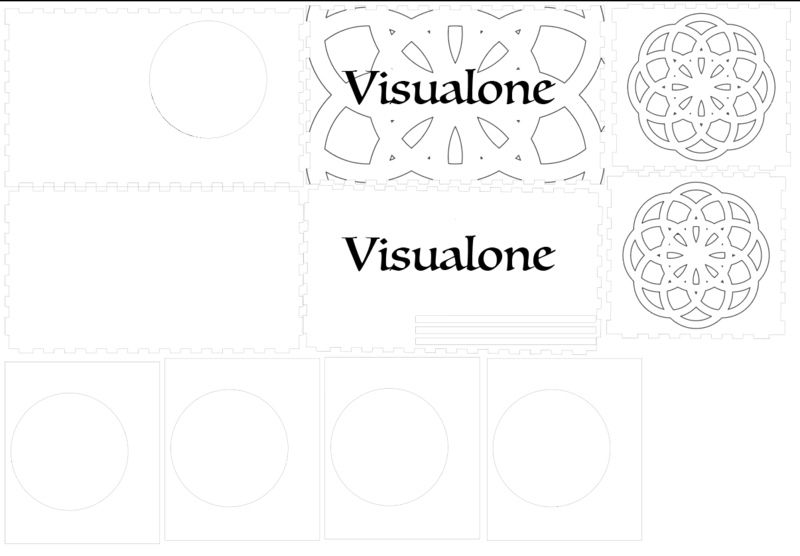 However, I realized this was probably not the best way to design Visualone, I decided to change my design for the box and the mechanism to rotate the templates. Now, the phone would be placed sideways, the the flashlight still facing the hole in the box for the templates, but the templates were going to be on a side of the box instead of on its top. And instead of having 3D printed joints to rotate the templates, I decided to simply give the templates a gear shape and to place them on top of round platforms which would allow them to rotate manually. Thus, after rethinking the project, I created a very simple prototype made out of cardboard, where the main structure of the object looks like a box. 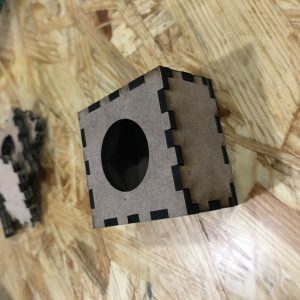 To make this prototype, I simply cut measured pieces of cardboard and hot-glued them together. My end product looks pretty much the same, except I fixed a couple of things. Bellow you can see my cardboard prototype. Once I had this, I started making the Illustrator files. The first thing I created was the box for the main structure. I used MakerCase to create the outline of the box because I figured it would save me a lot of time. Once I had the layout of the box, I created the hole for the light and the templates. At the bottom of these pictures, you can see the template holders which are 5mm wood, and above that, you can see the ‘walls’ between each of the templates, which were made out of 3mm wood. The templates were made with 3mm acrylic. 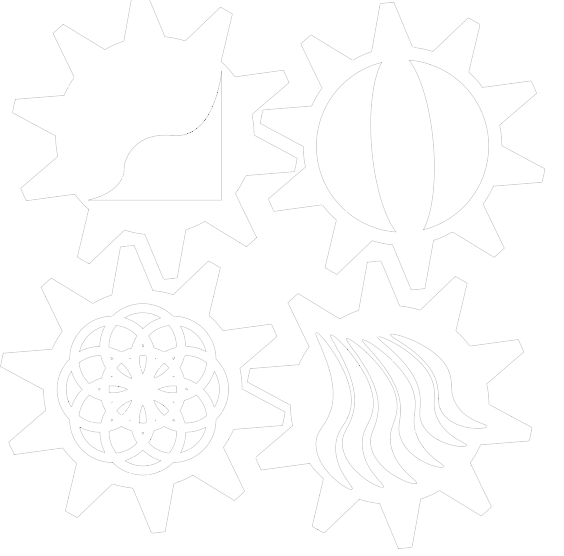 To make the templates, I created gears in Illustrator by using the star shape tool and gave it many sides. 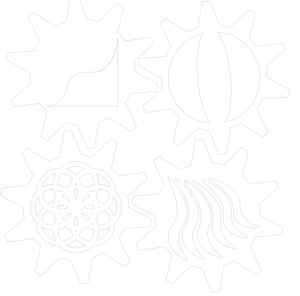 Then, I created two ellipses and with the pathfinder tools, I was able to create a gear shape. 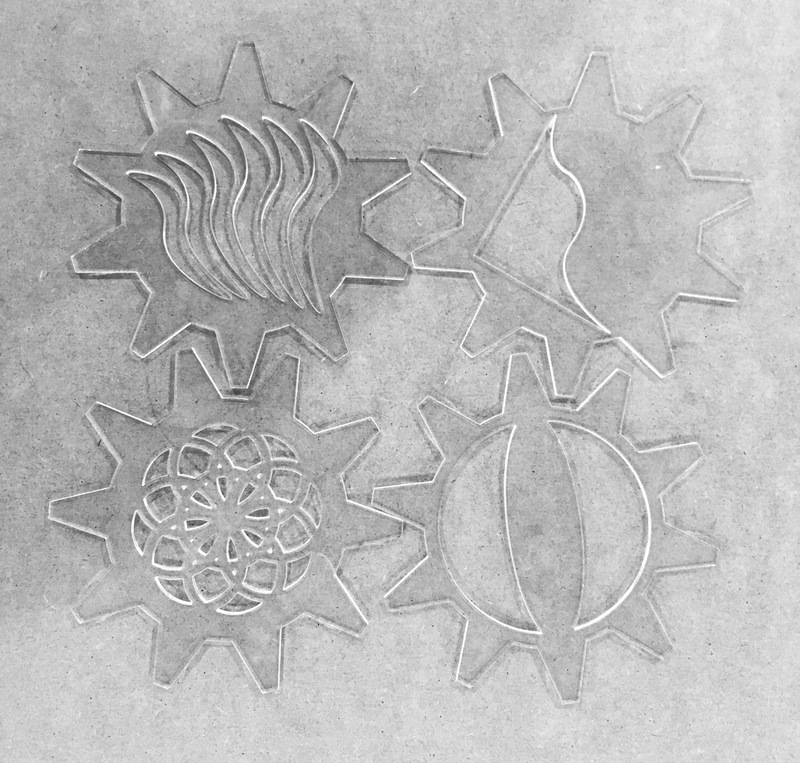 Once I had the gear, I added the shapes that would later be laser-cut. 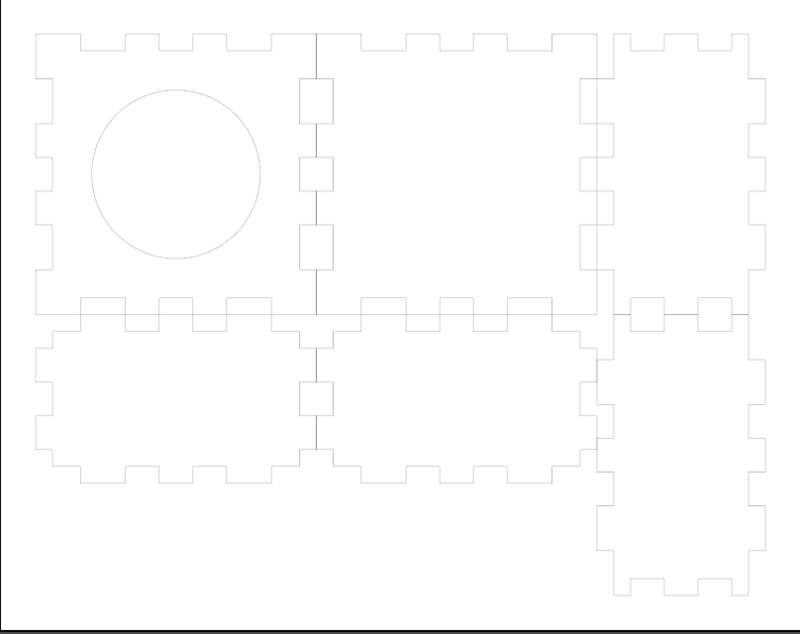 I do not want concrete figures for the visuals, so that is why most of the shapes are either patterns or other shapes. For now, I only have four templates, but I will probably design more in the future. Once I had my templates ready, I laser-cut them. 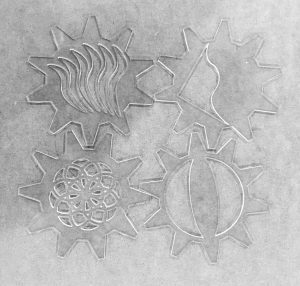 However, the first time I laser-cut the gears, I had calculates the measurements wrong. The center of the gears was smaller than the hole in the box. Furthermore, the main reason why I wanted gears to be the shape of the templates is so that I could rotate them by pushing the gear’s teeth. But unfortunately, in this first try, I made the teeth too small as well, so I could not grab the teeth from the top of the box. Thus, I redesign the gear and fixed them. The second time I laser-cut them I got the right result. Overall, I ended up changing my design quite a bit because I realized the original design I had thought of was not very effective for the result I was trying to have. 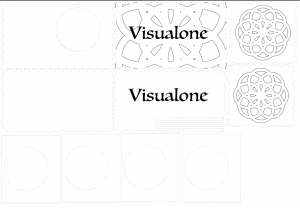 In order to create Visualone I used Illustrator as the main software for my project, as well MakerCase, which is an online resource to make boxes. Once I had my files ready, I laser-cut 3mm wood (for the box and the template walls), 5mm wood (for the template holders), and 3mm acrylic (for the templates). I am pretty happy with the result, but I would probably like to use a stronger light so that the visuals look nicer, and maybe even make the box and the templates a little bit bigger. As I proposed earlier, I wanted to create something that takes artifacts from the past and restores it digitally using the techniques of digital restoration and hybrid reassemblage. I was really inspired by the works of the Victoria and Albert Museum in London as well as photogrammetry and decided to create a replica of the Jadeite Cabbage to recapture the importance of craftsmanship, fertility, and auspiciousness jade carving had in the late Qing dynasty. First, I got an actual cabbage and took several pictures of it. I put those pictures through Agisoft then created a more realistic model by reducing polygons and building the mesh. 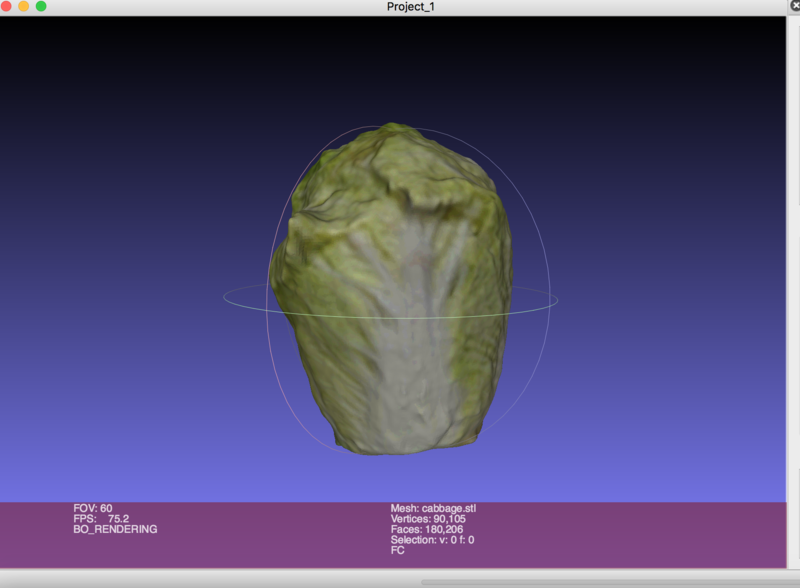 Then, I patched up any holes and smoothed out the model even more on Meshlab and Meshmixer. 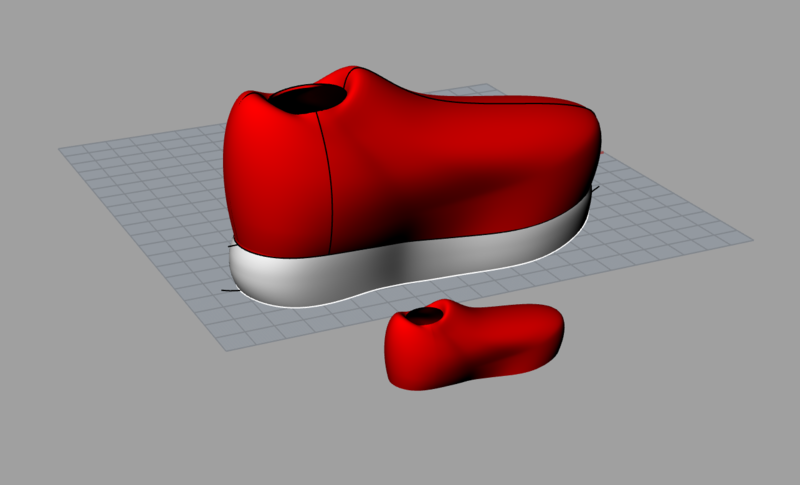 I saved the model into an STL file to prepare it for 3D printing. The printing process took about 5 hours and I got the model and placed it into an acrylic box I laser cut before the presentation. Overall, this was a very fulfilling project because I was able to learn a lot about using different machines and software to create a customized and innovative design. I just wish I had more time to perfect the model but given the time constraints I was pleased with what I was able to create and in the future I would like to do more with digital fabrication. For this assignment, I used the same design I had made on Rhino, refined the materials a bit and sent it through a few different 3D Printers as an STL file. 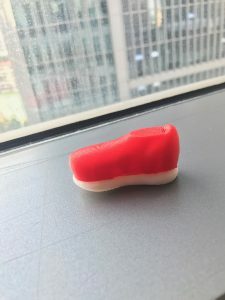 Using the JGAurora, Marcela helped me set up on the CURA software to stop the printing process up to the sole of the sneaker so that I can make it multi-colored. 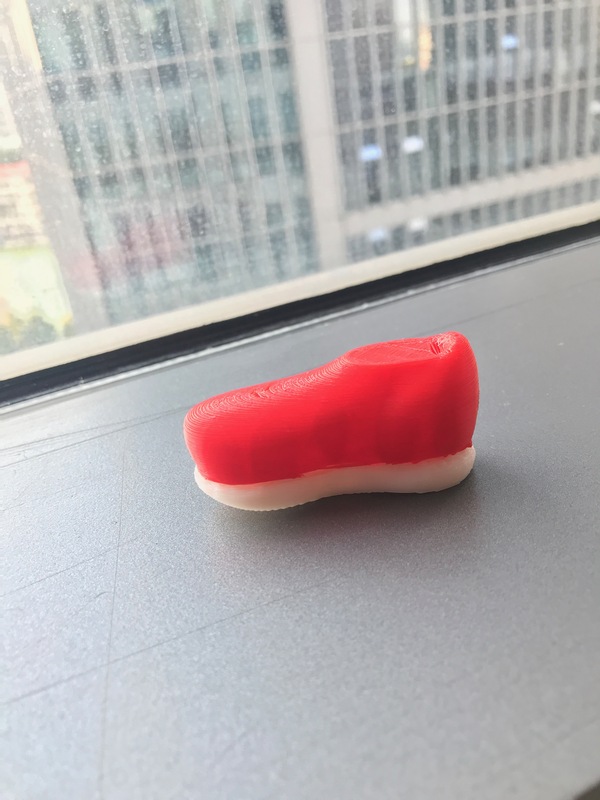 However, mid-way through the printing process I realized that the sole of the sneaker was not printing properly and had strange shapes. I realized that it was because in my sketch, the objects were not joined together, causing the system to think that there were multiple layers. 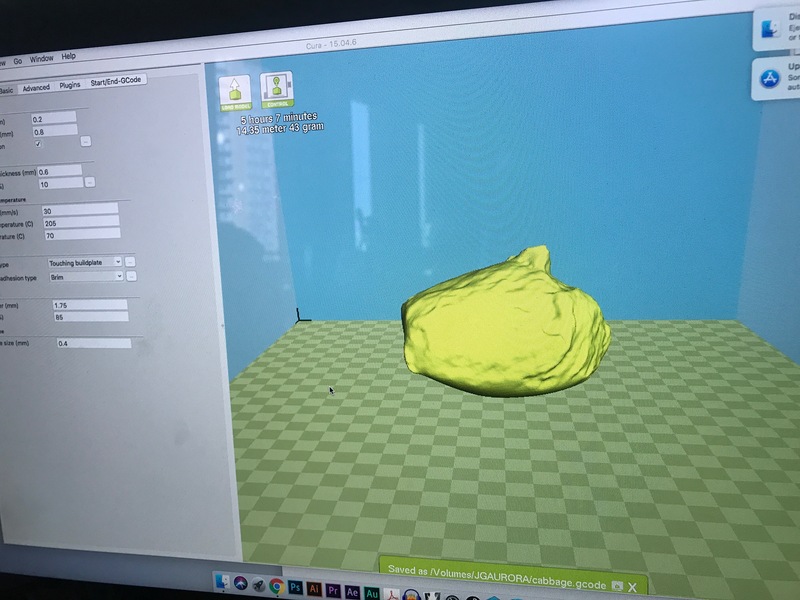 I was able to fix this problem by joining the surfaces together on Rhino but here was still the issue with the 3D printer. Even though I set the printer to stop after the sole, it kept printing and didn’t follow the settings I inputted into the file. So Marcela helped me use a different printer and glued the two pieces together.